1) It is funny. The show has a cute main character that does cute things in a funny way; there are plenty of side characters to enjoy also. 2) The show is actually relaxing to watch. Give it an episode or two after a long day to wind down. The combination of music, humor, and art actually made me relaxed while watching. 3) It's very different. The show is nothing like the regular combat anime that are just popping up. As a fellow anime watcher, with 350 series watched, I recommend anything that is done well of any genre. This was just such a sweet and charming show, that I took one episode a day and even a long day of work felt so much better. Just loved it - such weird and fun characters that it was just always putting a smile on my face. Ordered the DVD even before I finished watching it here! this is such a charming show. it's full of hilarious moments and characters, and a sense of wonder at everyday life. it's definitely a relaxing type of show, but it isn't boring, either! there's a good mix of quiet introspection and louder comedy bits. the animation is gorgeous (for 2007). 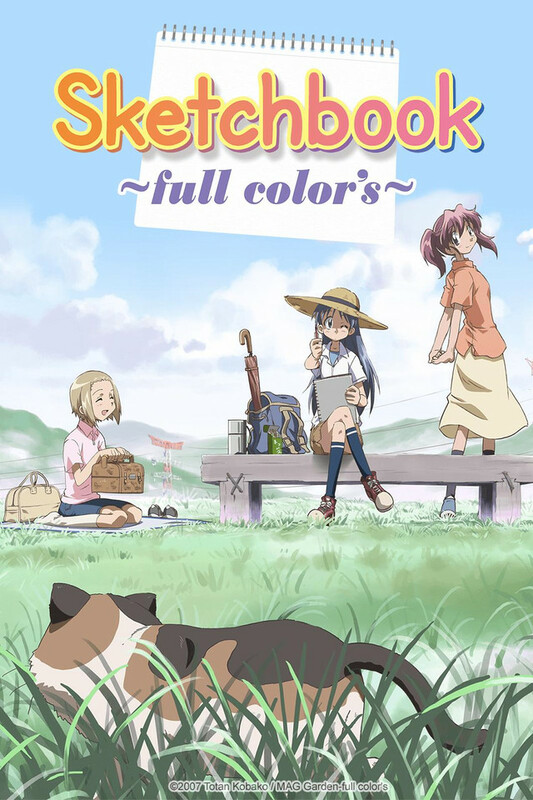 If Azumanga Diaoh and Lucky Star had a quiet well behaved cousin, she'd be Sketchbook full colors. With full cast of the usual , and unusual school life/club members, there are almost too many characters. Not much happens outside of the typical SoL/ school club series. OK not much happens at all. That's part of the series charm. 11 year old character design shows. The music is stellar, The soundtrack is perfect for drinking coffee on a Sunday Morning. Very slow but very enjoyable. This is what a slice of life should be! This show brings out the essence of slice of life in a cute subtle way! The characters are cute and unique, the encounters are calm and subtle, and the episodes are well pieced together to give us a cute, calming show to relieve us of any stress we had before. The ever so shy and friendly Sora (Japanese for "Sky") takes her sketchbook everywhere she goes and attempts to draw almost everything she see's. This show follows a Sora as she spends her days drawing the interesting events that take place around her every day.